Here at Avalon we place the utmost priority on the welfare of our clients and we seek to do everything in our power to ensure that you are properly informed and cared for. 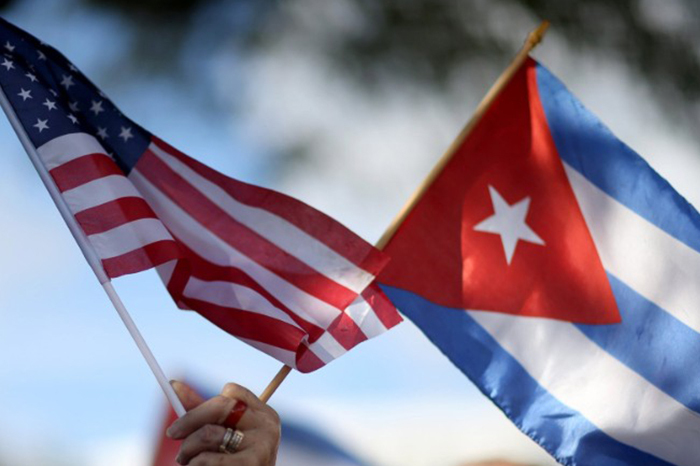 With recent comments from national security adviser, John Bolton, coming out this week regarding Cuba and increased restrictions, we feel that this is a good time to reach out to make sure that you, as our valued clients and friends, are up to speed on what has transpired. 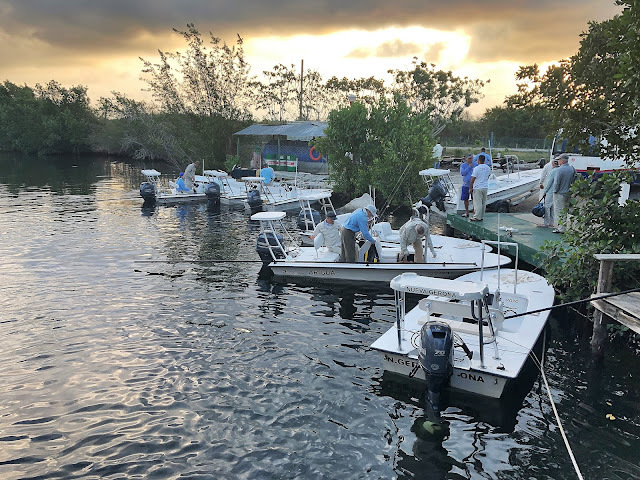 The main substance of the speech on April 17th was to enact Title III of the Helms Burton Act, which has received waivers from every single president in the last couple of decades. By removing this waiver, it has opened up the possibility of Cuban exiles to file suit against foreign companies profiting from land seized by the Cuban government after the revolution. Rest assured, we are not one of these unfortunate foreign entities, and we have taken steps in the 27 years of Avalon's history to make sure we are doing business completely legally and without connection to compromised territories. 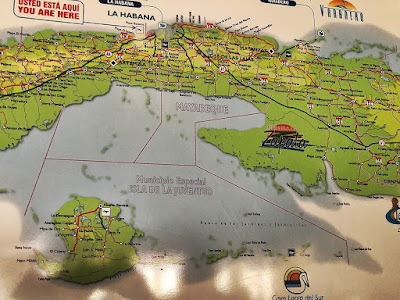 Furthermore, in relation to talks of further tightening travel restrictions for US travelers to Cuba, there is absolutely nothing concrete whatsoever enacted at this moment. 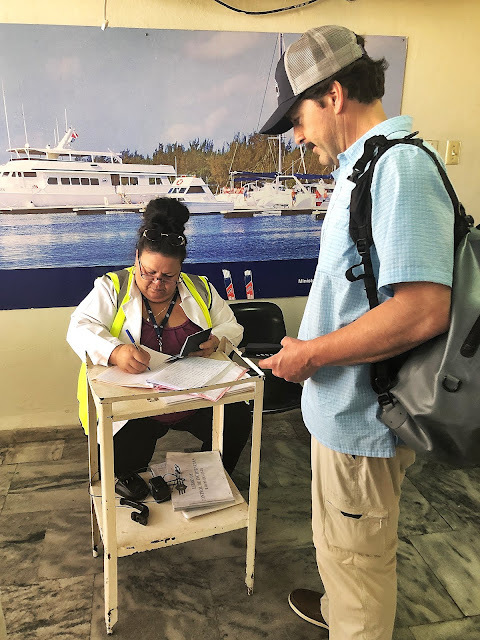 We may see some adjustments made by the OFAC on some of the travel categories, but just like the 2016 Trump speech, we found that very minor amendments were made months later and travel with Avalon to Cuba remained completely legal. Remember, we are engaged in the largest conservation initiative in the Caribbean, and by traveling with us you are contributing to this conservation program and making it a reality. 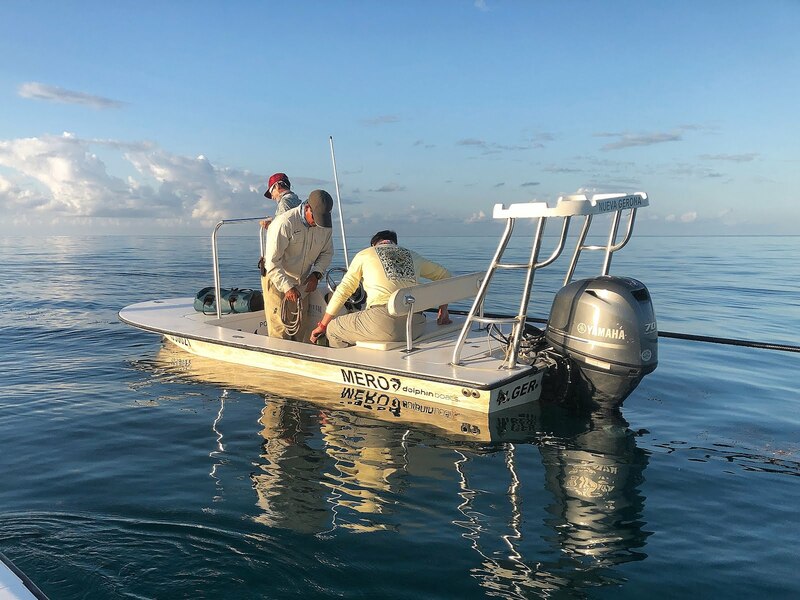 Without your continued involvement, our guides would not be out patrolling the marine parks and our fish would remain unprotected, leaving them susceptible to exploitation. Our sustainable conservation model relies on your continued support and we will always do everything in our power to make sure that your trips with us to Cuba are enriching, fun, memorable and completely legal. We will be working tirelessly to stay informed and improve the quality of our operations and conservation programs. During this interim, please maintain confidence and demand facts over political chatter. Once we hear of any updates we will certainly reach out to keep you abreast of the ongoing situation. For now, we are as excited as ever! 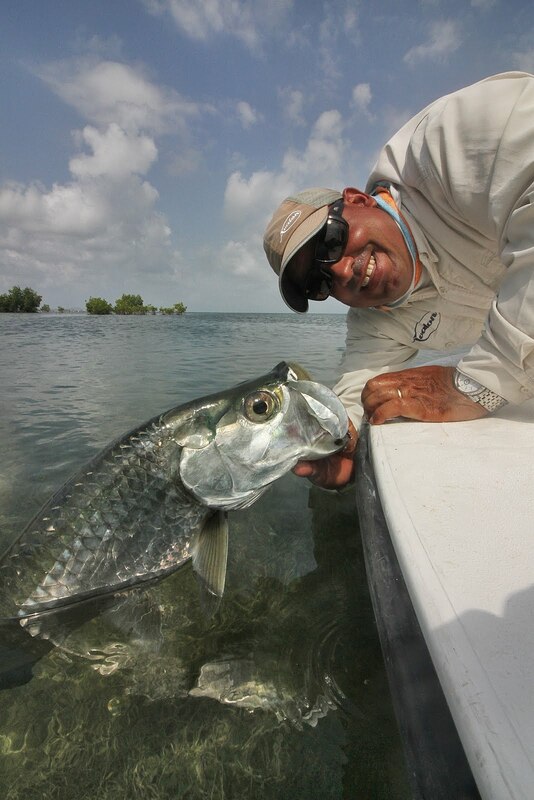 It's tarpon season and we have had an incredible bounty of wonderful reports coming in from all of our locations in Cuba. In an effort to share some more of the good stuff with you, we want to extend the following offers for the coming months and years. Our hostess, Eysa, cheerfully promised coffee would be on at 6:30 am. It was. A beautiful (and miles more than ample) breakfast of fresh fruit, pastries, eggs, and bacon followed at 7:30. Then it was off to grab gear, glob on some sunscreen and grab drinks for the day. The gang rigged and ready. We were in the immaculate Dolphin skiffs soon there after. It was quite clear we were surrounded by very competent people from the Avalon 1's captain, to our chef and staff all the way through our amazing cadre of guides. 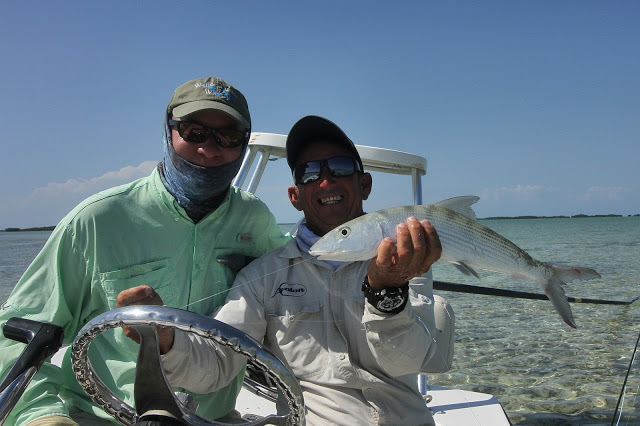 Steve Peskoe and I took off on with head guide Manolo who was simply superb all day. 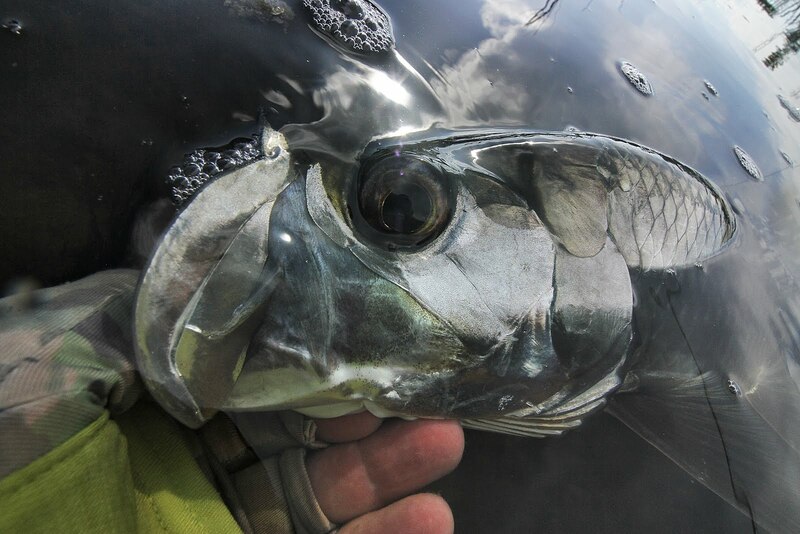 Initially, we left the mothership running under a light rain with calm winds... perfect tarpon conditions. As soon as the rain stopped, the winds began and a cold front soon zipped in like a party buzz killer. These strong cooling winds didn't leave us for two days. Cold fronts are the bane of tarpon fishing, but still we managed to find and catch tarpon each day. In fact, I boated two tarpon on my first two casts. I should have quit right there while I was batting 1000! 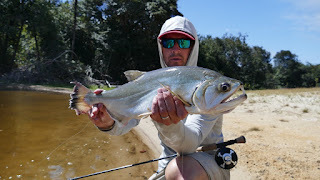 Steve managed to jump and land a few fish even under our deteriorating conditions. 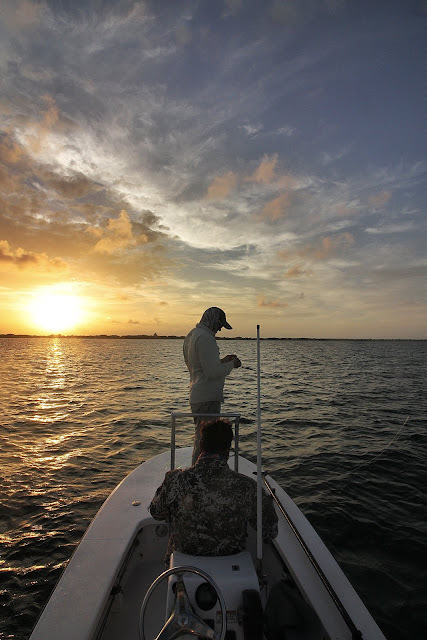 Manolo pressed hard until the sun slid beneath the horizon's cloud cover. Within 15 minutes, we were back at the Avalon 1 listening to our compatriots stories mostly of success and the competence of the guides. A great day, despite the coolish weather, was had by all. As the evening wore on everyone settled in including the staff. 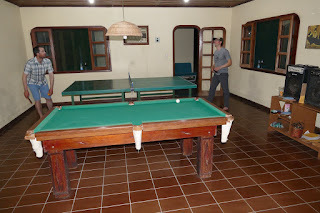 The atmosphere became very jovial and relaxed. 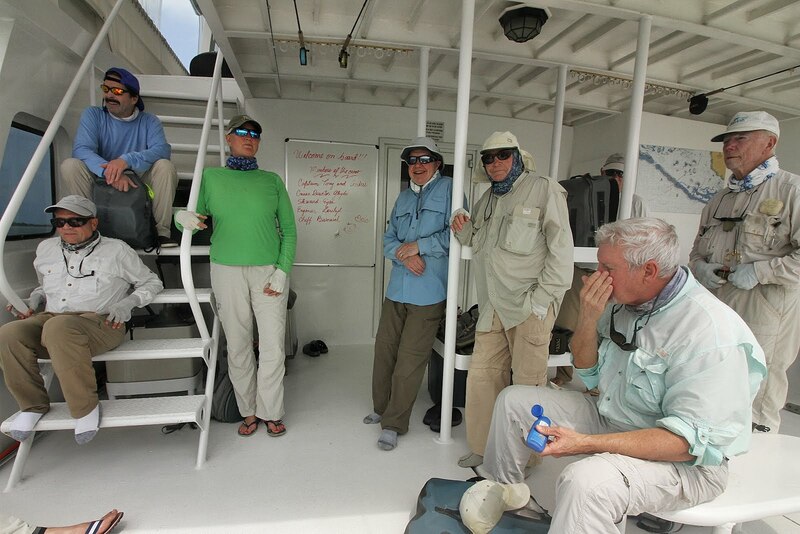 Not only could this group fish, but they knew how to have a good time... the guides and staff immediately picked up on this. When this occurs... an atmosphere of fish hard, confidence in the guides, blame yourself for any failures and don't make it all about you... success is virtually guaranteed. I knew this would be a good week!! 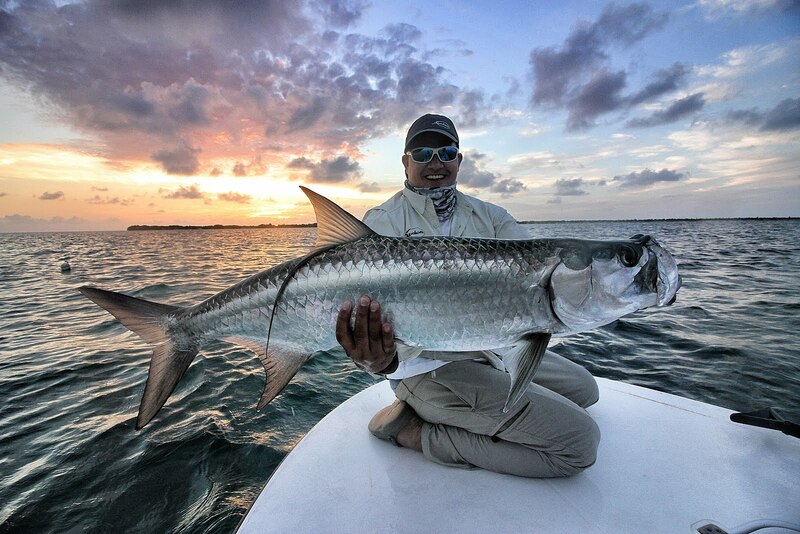 Our schedule was perfect for tarpon. 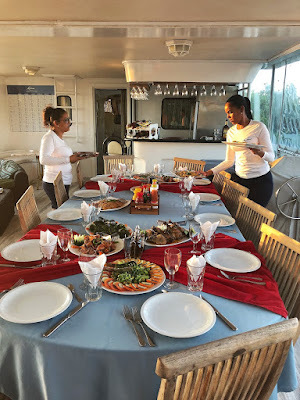 Fish the morning until 1:00 pm, break for a sumptuous lunch on the mothership followed by a siesta, then back in the boats until dark. And when I say dark, I mean dark. 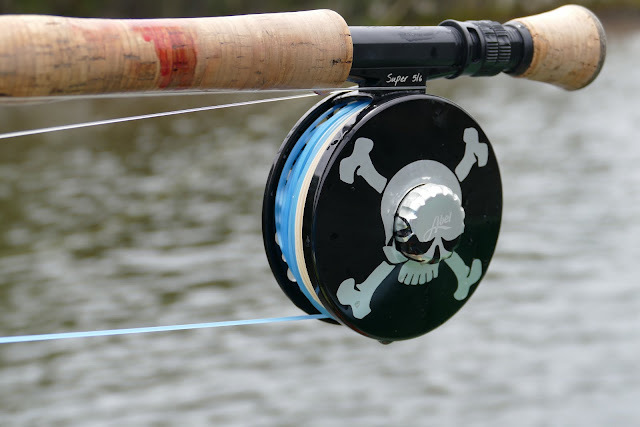 We were never pushed to quit early, in fact we were often pushed to make "just one more cast". On day Two, John Riggs and I were winding down after a very full day. We had been in tarpon much of the late afternoon on a falling tide and successfully fished a channel that was quickly emptying a large basin. When we pulled up, we knew there had to be tarpon in the swift current. 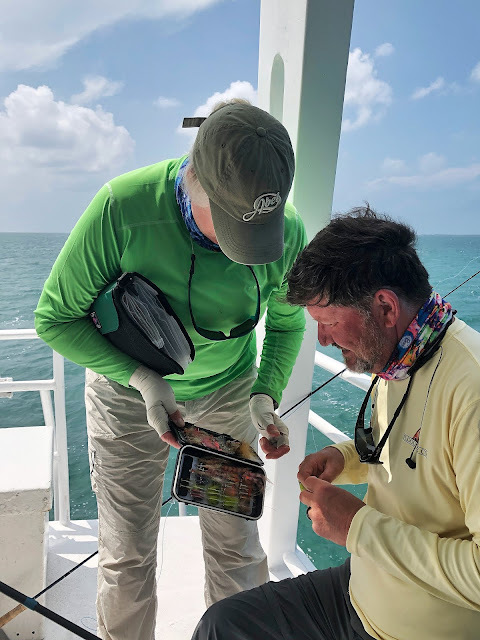 John immediately caught a solid fish of 15-20 lbs., then jumped and landed many more until we had tagged almost every fish in the run. Scott Sawtelle and our "cruise director" Gleybi. John Riggs boating another jumping maniac. 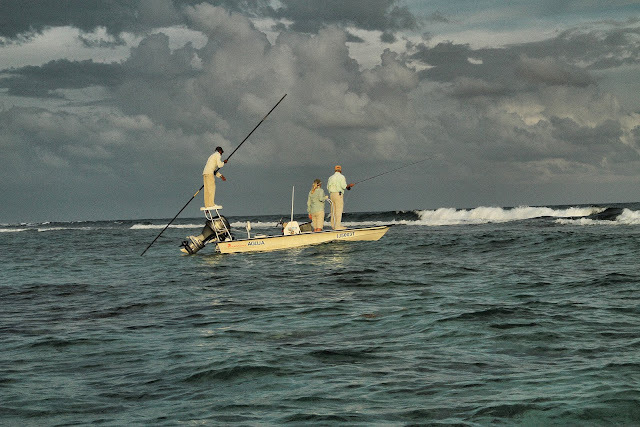 The reef... where the big tarpon hang. 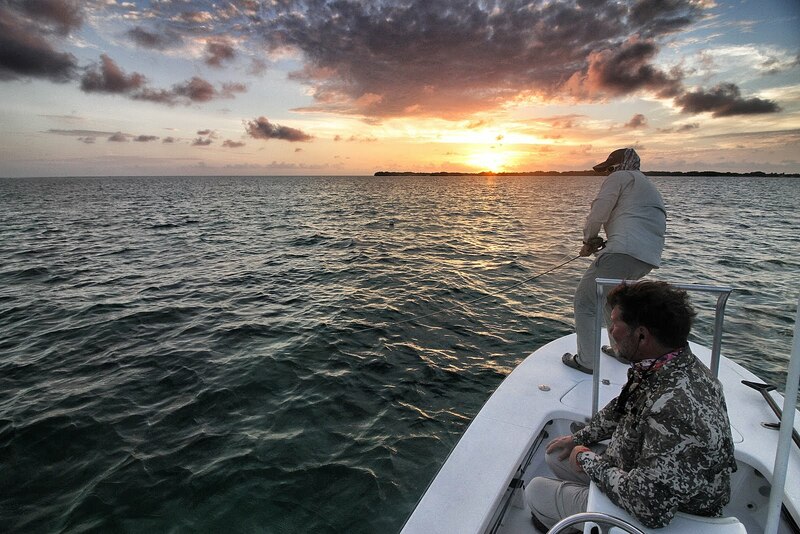 Wicho moved us to the reef to get some shots at the "big boys" and with the sun setting, John finally called it quits. 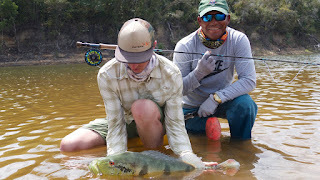 We were both spent, so we handed the rod to Wicho who promptly got into a big fish. John and I drank beer and cheered as Wicho worked. A perfect way to end a perfect day. After a good struggle, Wicho landed his fish. We fist-bumped our guide then stored the rod. Wicho was thrilled with the opportunity and we were thrilled he was successful. Soon it was back to the boat for cocktails and another fabulous dinner. 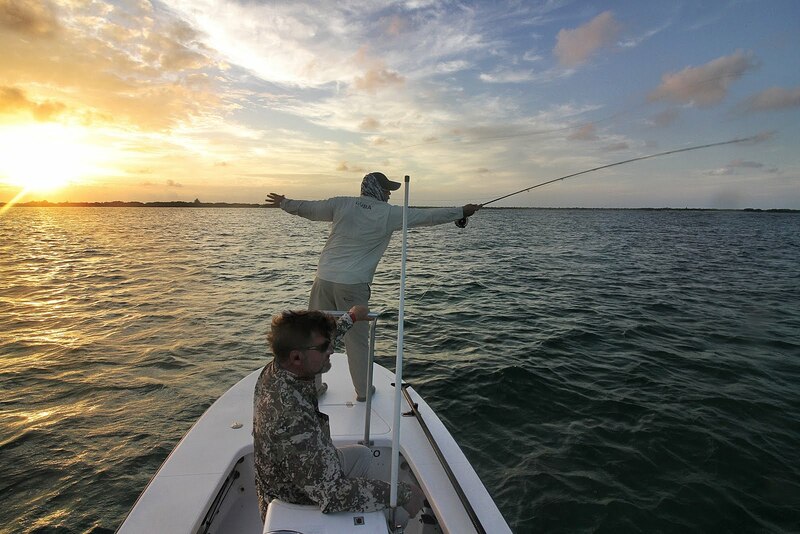 A thrilled guide and a perfect way to end a day. It's hard to repeat a great trip. But most of us were here again... ready to give it a try. 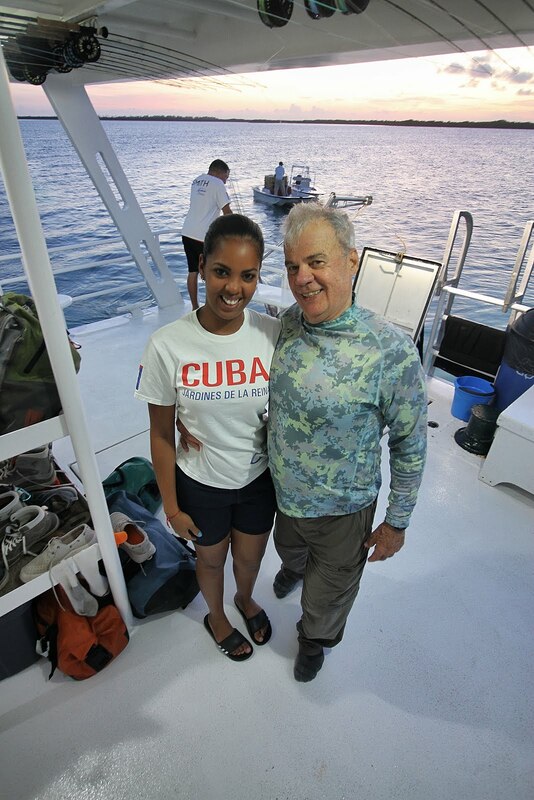 We were again headed to the southern shore of Cuba. Last year we were in the Jardines de la Reina. 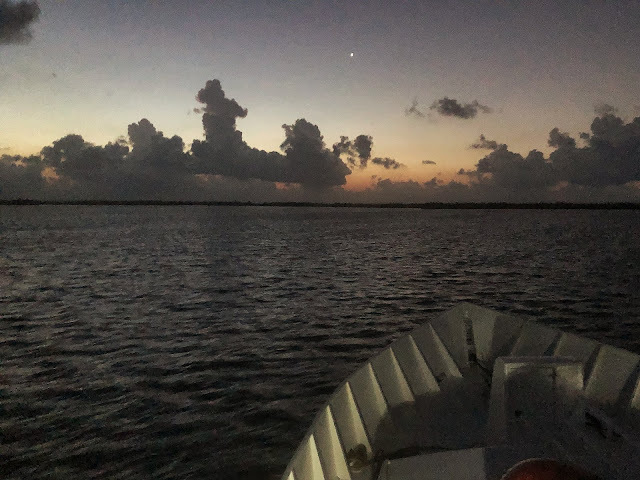 This year, we were headed a bit west to the Islands of Youth (Islas de la Juventud). Could we do it again? ... Could we have a repeat of that sensational trip to the Gardens of the Queens last year. 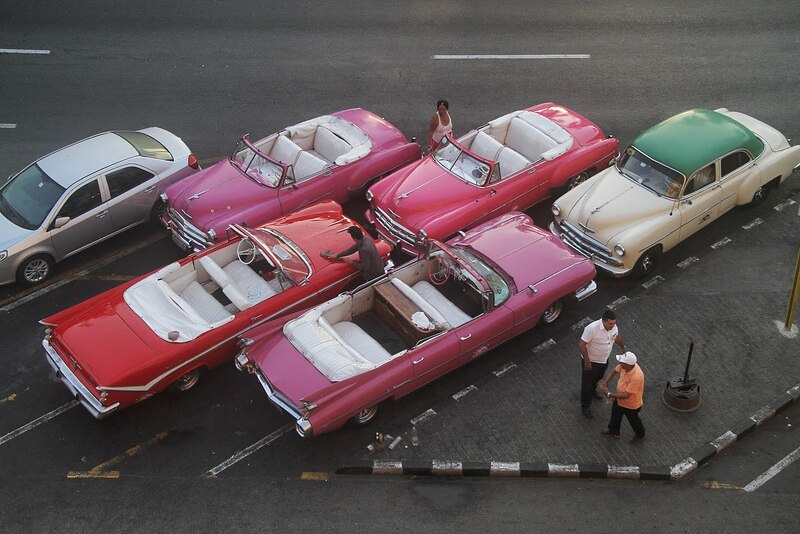 We began in Havana at the Inglaterra Hotel on the main Prado. 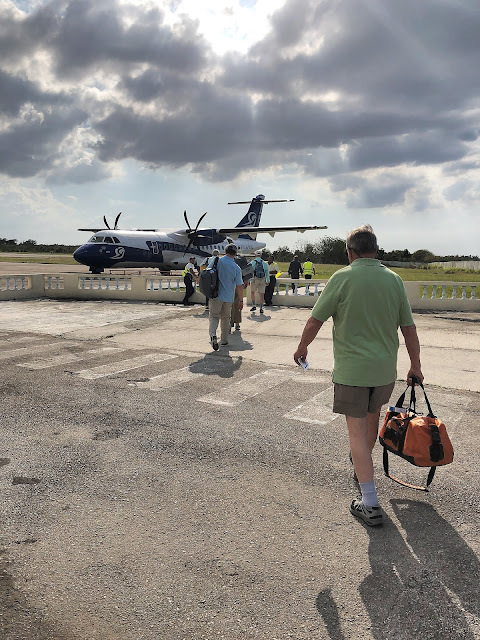 Our charter was on a ATR 42. This craft is a twin-turboprop, short-haul aircraft developed and manufactured in France and Italy by ATR. In 1978, Fidel Castro presided at a state ceremony changing the name of the Isla de Pinos (Islands of Pines) to Isla de la Juventud (Islands of Youth). Castro dream was to turn the island into a grand communist university for students from around the world. Castro brought in students from many communist leaning countries including Angola, Nicaragua, Venezuela, and Chile. Today that dream is long gone. Most of the school's buildings are abandoned and the island has reverted back to its agricultural roots. Castro sans beard... his 1953 mug shot. Hell on earth... every hole is a cell. Fidel had a special relationship with this archipelago. 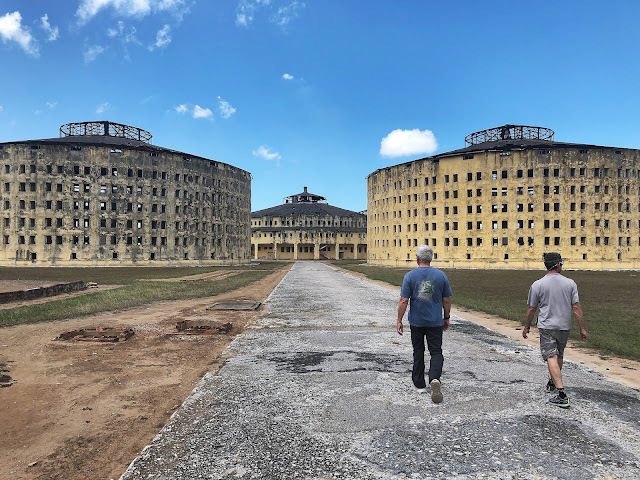 Just outside the main town of Nuevo Gerona sprawls the Presidio Modelo, or Model Prison, Cuba’s most dreaded and imposing pre-revolutionary prison. 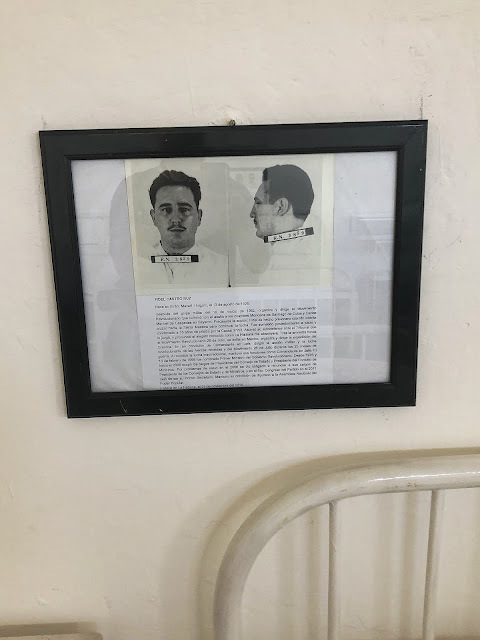 Inside the infirmary, posted on a wall, is a mug shot of its most famous inmate, Fidel Castro. In 1953, when, as a 27-year-old lawyer, Prisoner 3859 began his rebellious career with an attack on a military barracks in the city of Santiago. Castro had hoped this act would spark an uprising around Cuba, but it failed abysmally. Many of his approximately 160 followers were tortured and executed and most of the rest hunted down. 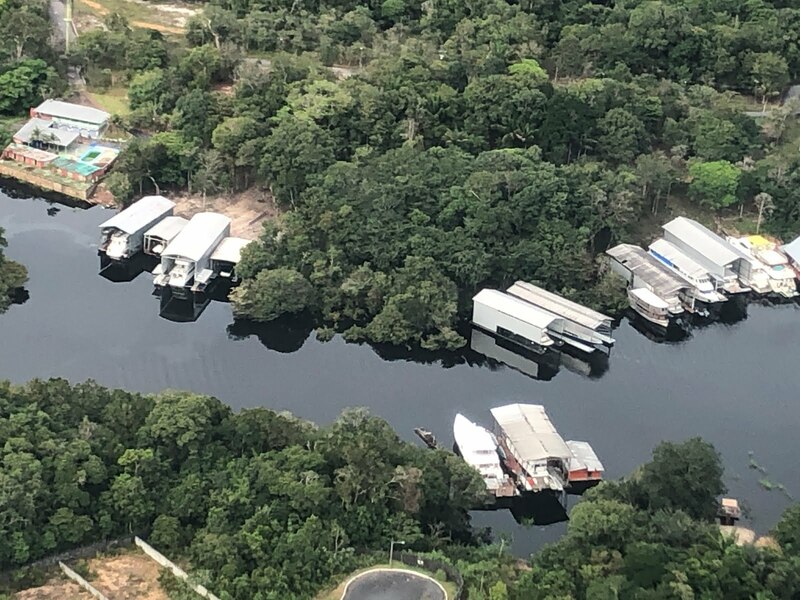 He was given a 15-year sentence and sent with 25 compañeros to La Isla. It was here the revolution was planned. Inexplicably, three years later Batista released Castro and the rest, as the say, is history. Now almost 70 years later, my crew was here to fish. After descending from our charter from Havana to Nuevo Gerona, we had our passports recorded, our temperatures taken and our bags delivered. Outside the main terminal, we met an air-conditioned bus and drove to the dock where we got our first view of our home for the next week. 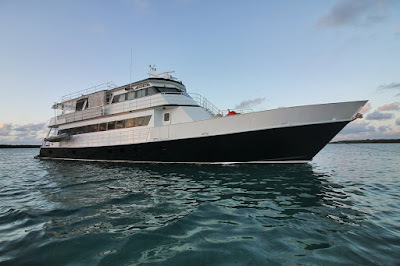 The Avalon 1 sat at anchor. 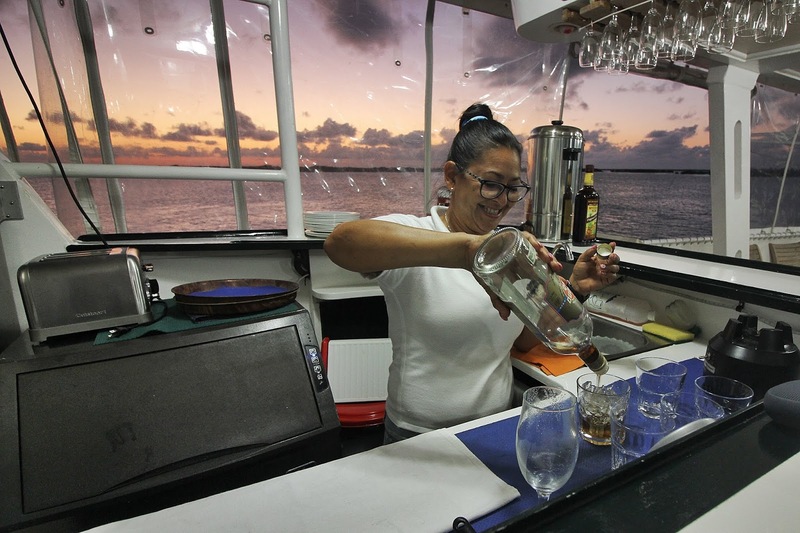 We walked up the gangplank, grabbed a room and soon had a Cuba Libre in our hands. Eysa serves a mean cocktail! 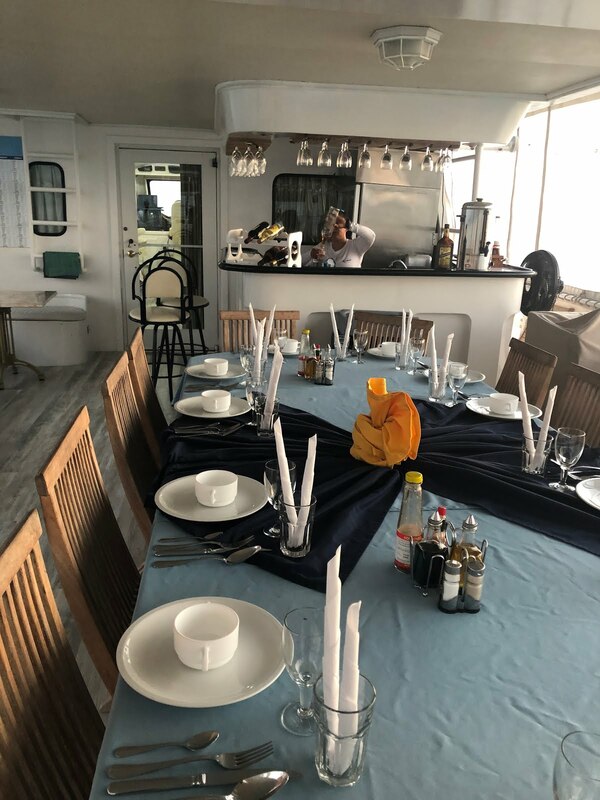 Eysa and Gleybi set a beautiful table. 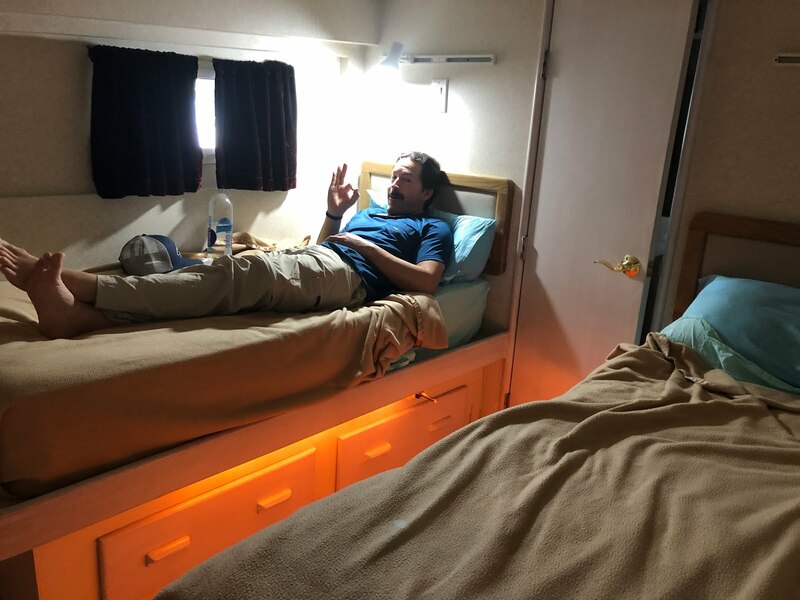 Avalon I cabins are very comfortable. 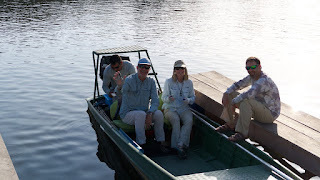 Great skiff and guides too! 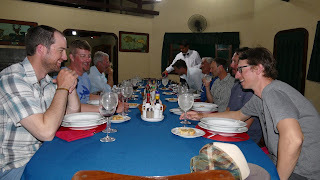 We knew after our great trip last year, it would be tough to match that experience, but everything seemed in place. 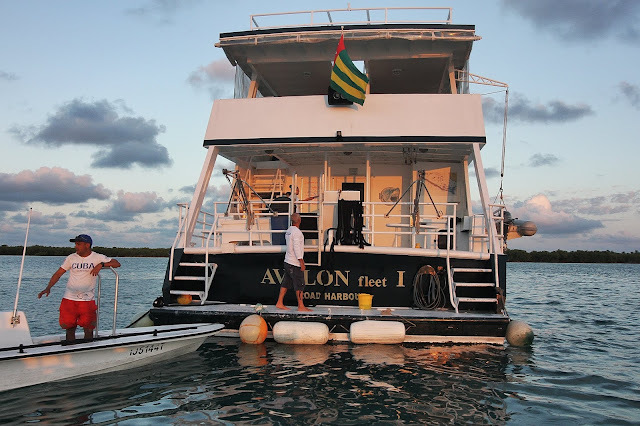 The Avalon 1 was beautiful, the staff obviously superb and the skiffs, now on trailers in the boatyard, were beautiful with virtually new 4-stroke engines. Weather permitting, this would be a good week! John and Anna Riggs make a fly selection on the first morning. NEXT... Let the Games begin! Jeff in Cuba... that country will never be the same. As much as I fear unleashing Jeff Rodenberg on the peaceful nation of Costa Rica, the dye is now cast. 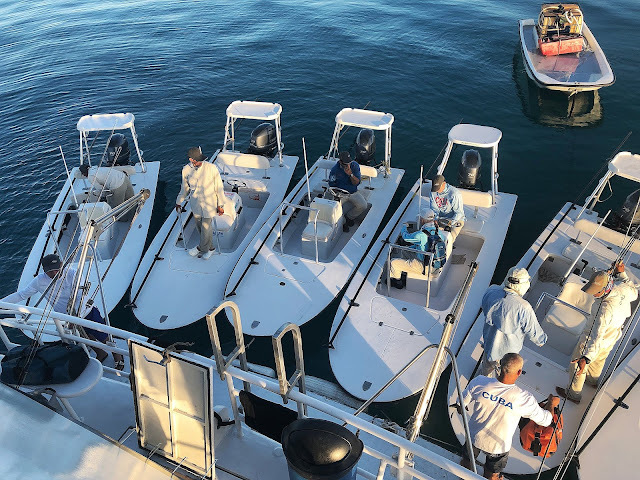 Boats are reserved, guides are secured and monies are transferred. In other words, it is too late. He and his daughter will arrive in Costa Rica soon. As such, I have notified the American Embassy in San Jose to be fully prepared for an international incident. So Costa Rica, if you let him in, you deal with consequences. As before, my comments are in red. Welcome to the family Peter! 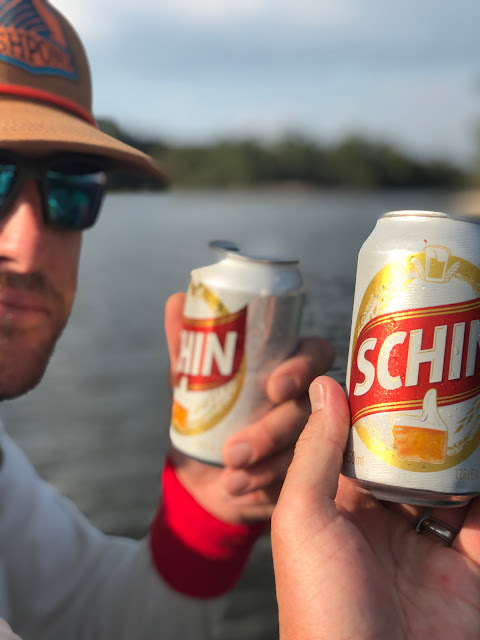 Peter Widener and Cole Burnham just returned from Angling Destinations' second hosted trip this season to Brazil's Agua Boa River. They had a great trip and a great time! 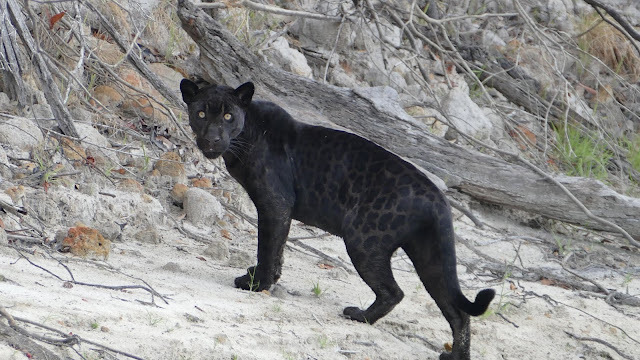 In addition to the great fishing they experienced, they also saw a black jaguar. For all of you Agua Boa alumni... YES!... 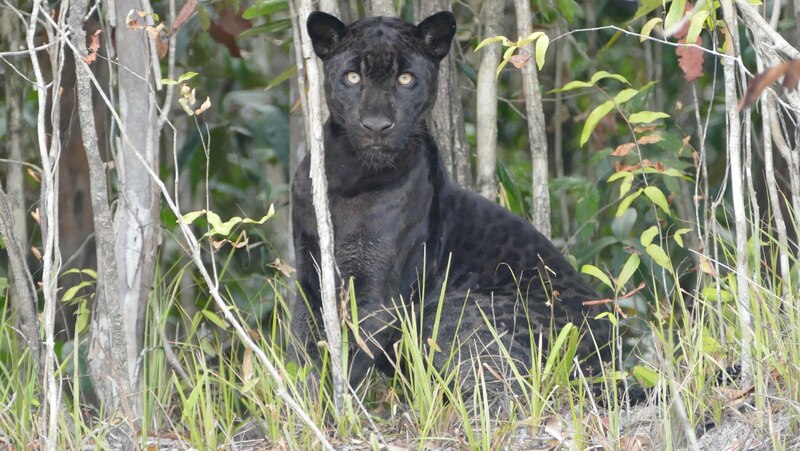 a black jaguar! Many of us that have been to the Agua Boa before and have never seen a jaguar will be very jealous - including me! Picture this, you are on your way to “The Amazon”! 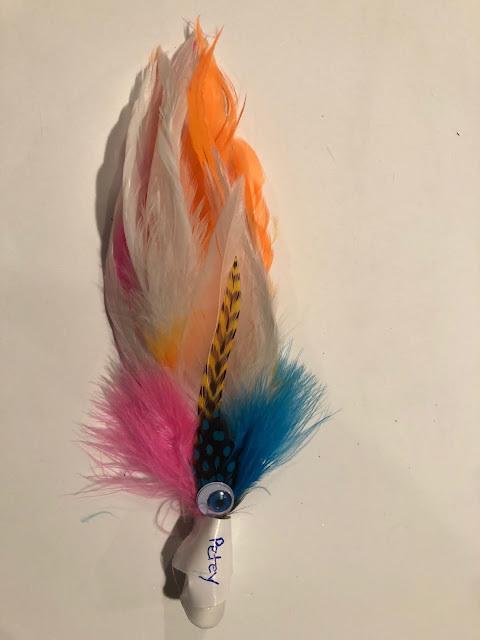 You're going to be in the middle of nowhere to chase peacock bass. 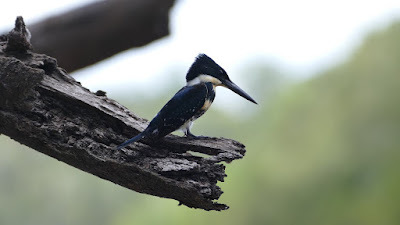 You’re not sure how to pronounce all the various types of species you'll encounter (even though you did take some Spanish in High school, you understand that Portuguese is not very close). As your American Airline flight rockets over the Gulf of Mexico, the Agua Boa Lodge experience awaits you. 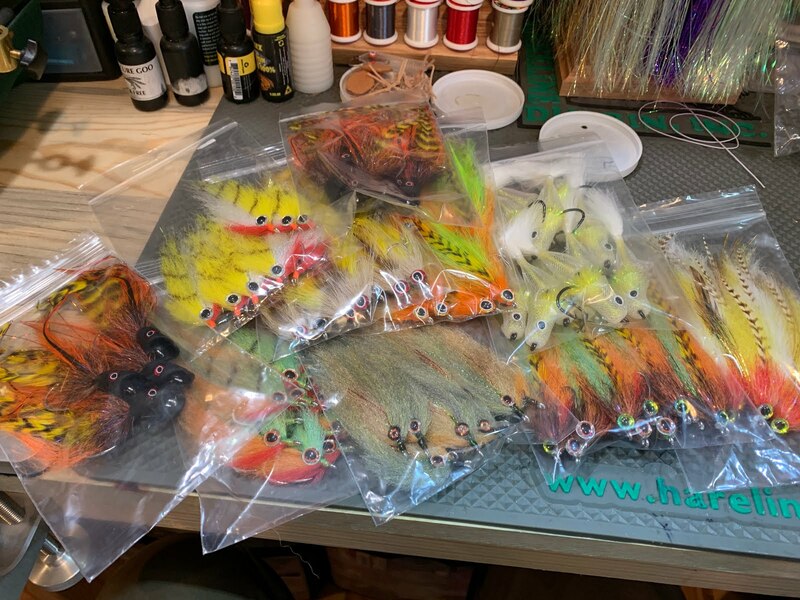 Fly fishing and international travel and the opinions we all form from those experiences including the methods and tactics are all expressed differently by us all. My personal take on the ABL experience was as highly rated as any fishing experience I’ve ever had. I like to rate my trips in a binary code fashion; either I would go back every year or “Ah, I'd go again, but not a have to” go back. ABL is definitely the former, going every year would be terrific! I could not imagine it would ever feel like the same old trip (if I was lucky enough to go year after year). Now on to the the dirty details of what we all read fish reports for….the gilled friends we catch and release, the animals we see, and the people we meet. 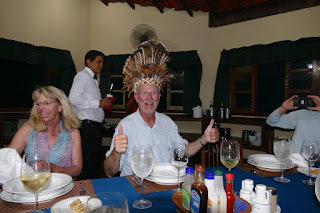 The morning after arriving in Manaus, you depart in a private charter. a little after dawn. 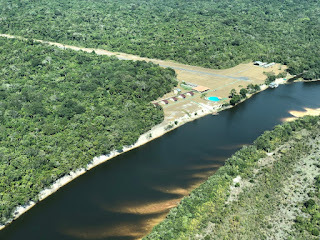 An hour and forty minutes later, you land at the lodge’s private runway. You are greeted with champagne while you stare at a giant circular swimming pool that begs you to jump in and hit the reset button on your bodie’s jet lagged joints! While sipping your champagne, you walk into the dining room and enjoy a wonderful meal and prepare your lunch for the day. While the crew and guides put your bags in the rooms, the hosts prep you for the fishing you’re about to dive into after breakfast. Within the first few minutes you see birds, mammals, amphibians, reptiles and insects that are for the most part out of a Jurassic Park movie! 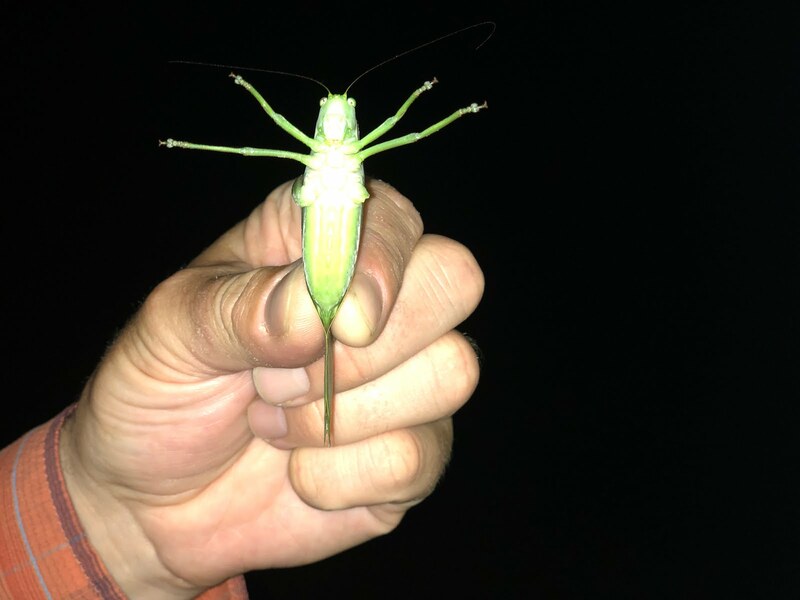 Grasshoppers the size of swallows, caiman the size of a VW bug (with the convertible top up) and macaw the size of a small eagle. 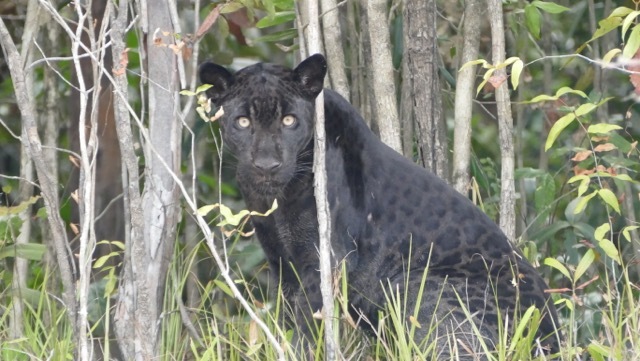 And you might even be lucky enough to spot a yellow spotted jaguar or even the very rare all black variation. Our group was lucky enough to see both and capture some really great shots of these animals, but in particular the black jaguar held still long enough to snap some once-in-a-lifetime photos. Dear God, I’m a page into this report and haven’t even touched on the incredible peacock bass and all the other amazing fish species the ABL experience has to offer. We spent 6.5 days sight fishing for 10-18 lb. peacock bass. A bass in that size range has a mouth you could literally fit your fist into! 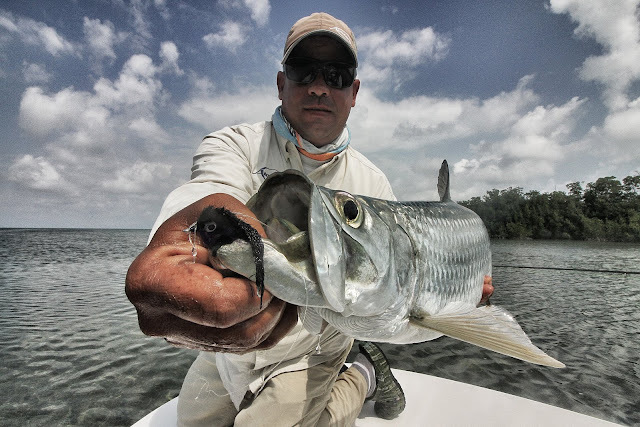 This is a fresh water sight fishing experience, similar to flats fishing on the Yucatan Peninsula for cruising bonefish. 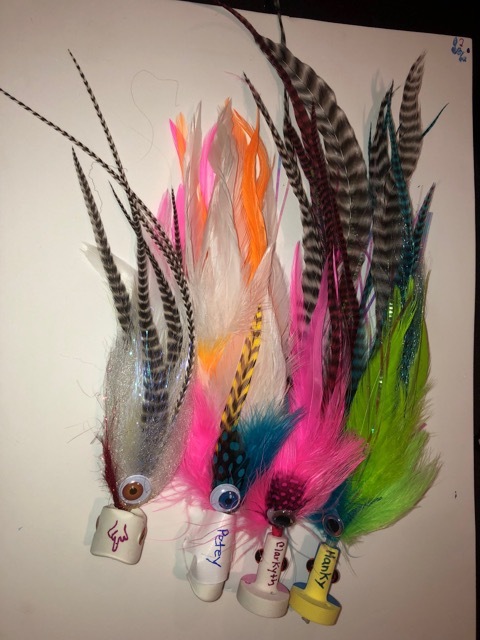 Your guide WILL have the best eyes in the business. Just make sure his 11 o’clock is the same as yours and you’re all set! 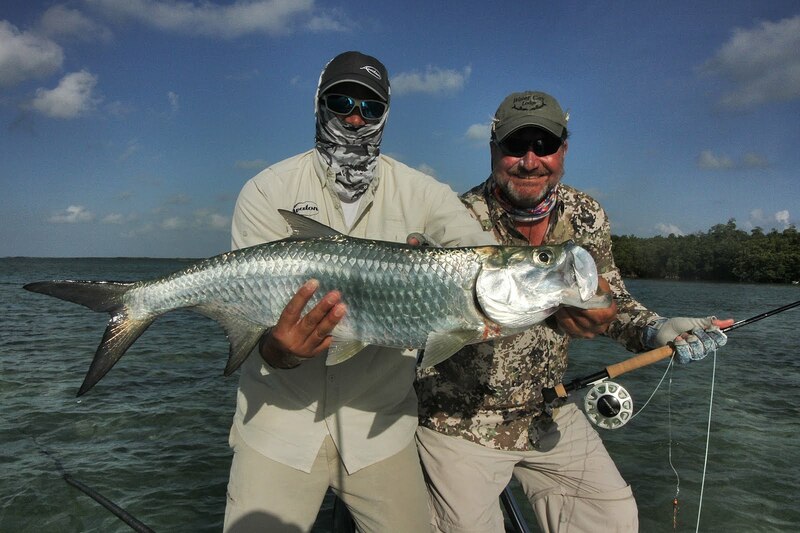 The eats were like the proverbial toilet flushing on the the surface and the fights intense enough to make an 8wt. bend at the cork! There truly isn’t one of the peacocks subspecies that I would say is unimpressive. They all have their own uniqueness and all are pound for pound as powerful as you can imagine or have heard about. They live up to their reputation in all aspects. 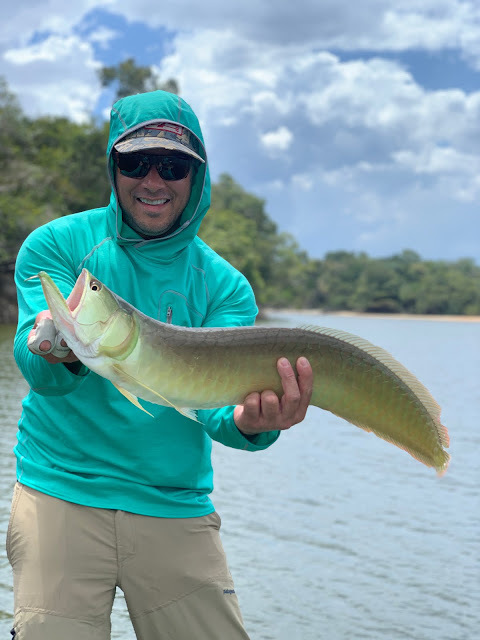 The other species pursued on the Agua Boa River consists of Payara (Vampire fish), Arawana, Bicuda, Wolf Fish, and many others! 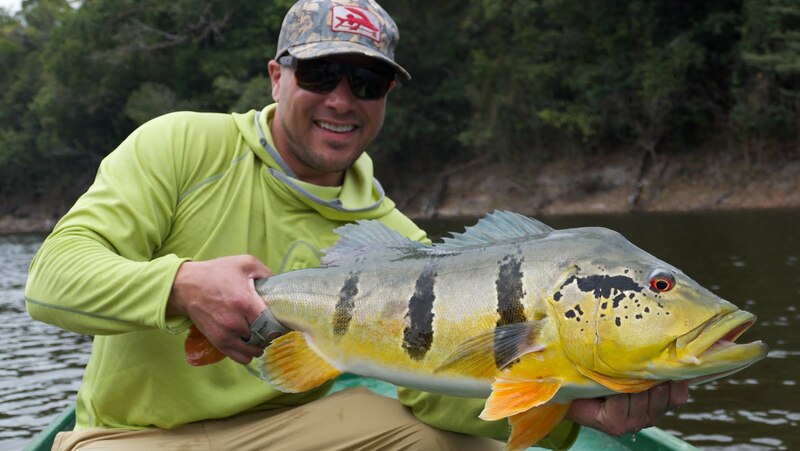 However, the most sought after species would hands down be the legendary Araipaima also known as the Pirarucu. 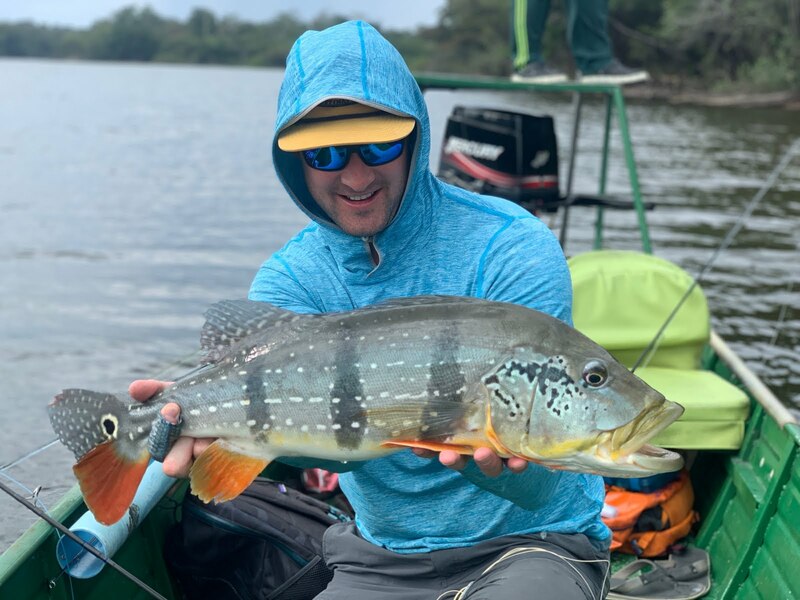 This dinosaur of a fish is similar to a tarpon, but much more snotty like a permit in the sense that if they don’t want to eat your fly they just won’t. I felt they would give you the middle finger if they had one to give. A few from our group caught them, and they earned them! 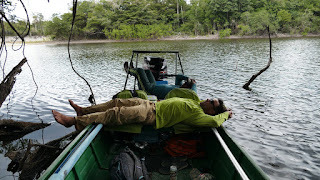 Many hours were spent chasing arapaima and they succeeded. 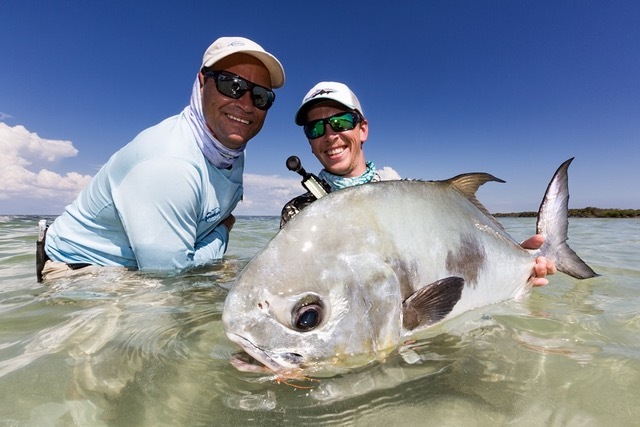 Congratulatuons to John Ritterbush, a Sheridan Wyomingite, and Dexter Levandoski of Patagonia's Fly Fishing Division for there arapaimas!. 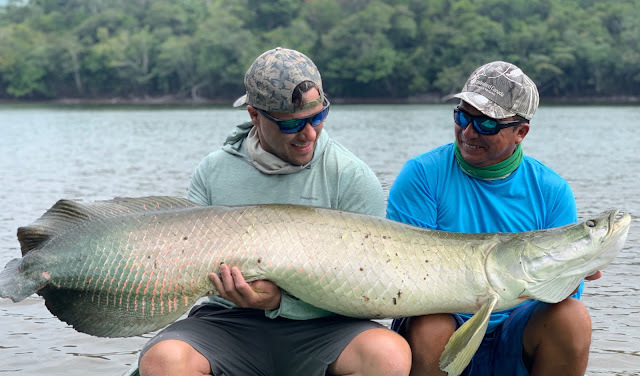 Big fly = big fish sometimes applies and big fish = big smile usually applies, but Arapaima landed means a huge smile 100% of the time... (and maybe a few tears probably blamed on some SPF 45 leaking into your eyes from the last half hour's workout to trying to land this living dinosaur). In summary, the Agua Boa experience encompasses incredible fishing, lots of laughs, airline beverages, jet lag, foreign architecture, and a whole plethora of cultural events one trip isn’t even close enough to cover. I can’t say enough the quality of care from the lodge and its hosts to the quality of the guides and their professionalism. 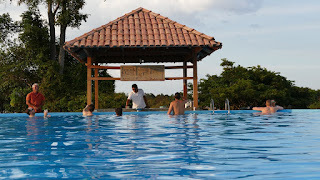 Agua Boa Lodge is a one of a kind experience and should be on your GOTTA GO Bucket list.